I love cooking eggs for breakfast and dinner. 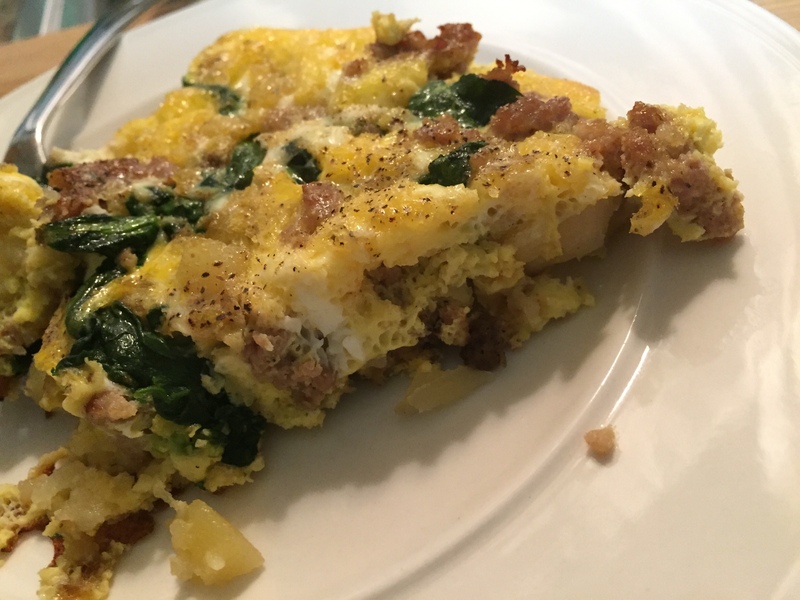 This frittata recipe is so simple and easy and is perfect for either breakfast or dinner. It’s also perfect to take to work too. I did not add cheese to this but you could, even sautéed mushrooms would work well. I just do not care for mushrooms. Oh and roasted red bell peppers too! And bacon! You could also add crumbled, crisp bacon!! Oh how delicious that would be!! 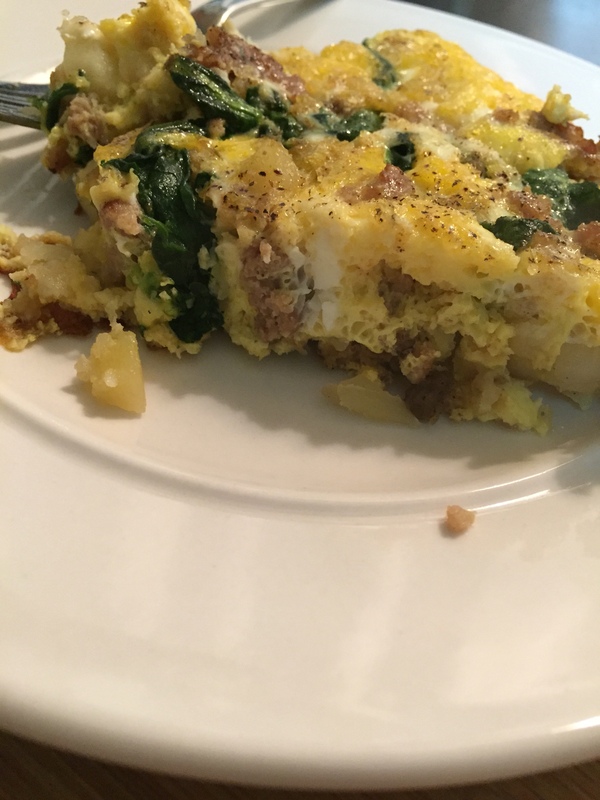 Looks like I need to make more frittata! 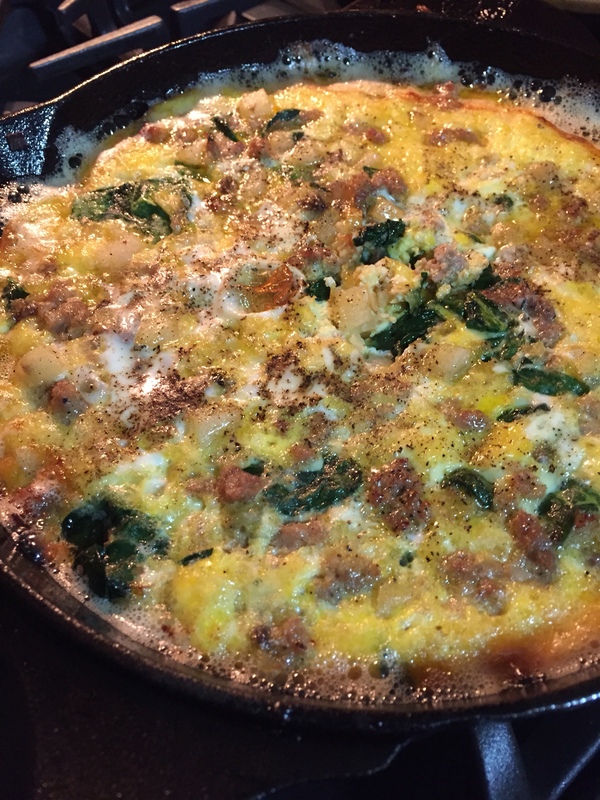 In a cast iron skillet over medium low heat, sauté onions and sausage until browned and crumbly. Season with salt, pepper, paprika, cumin and cayenne pepper while cooking. Remove sausage mixture from pan and set aside. Next, sauté potatoes until tender and golden, adding more oil if needed. Season with salt and pepper while cooking. Add the sausage and onions back to the pan with the potatoes. Add the spinach, tossing until cooked. When everything is tossed well, spread evenly around the pan and turn off the heat. In a separate bowl, whisk eggs and milk, salt and pepper. 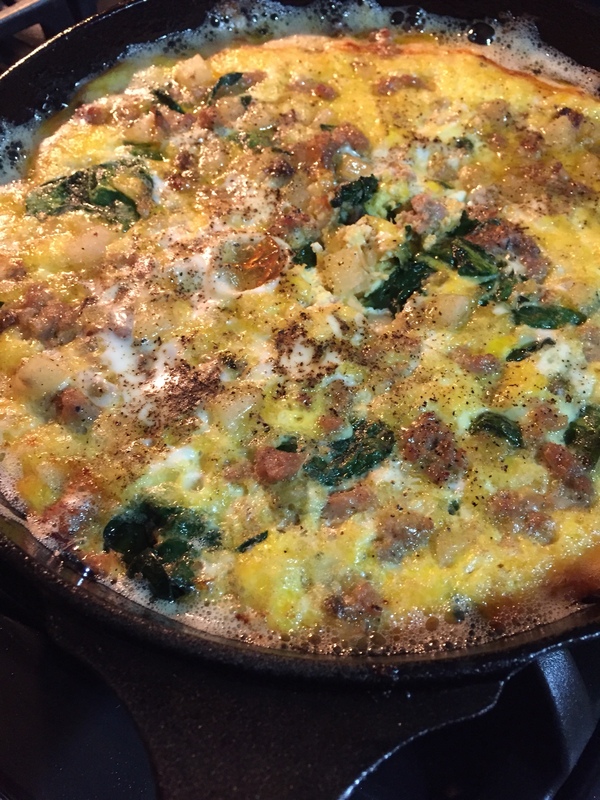 Pour egg mixture over sausage and potatoes but do not stir. Place the skillet in the oven and bake for about 15 minutes or until eggs are cooked through and set. I usually love the winter months, I usually love forecasts of snow and hope to be snowed in for a few days, and basically, I just love snuggling in and being quiet for the colder months. But this year, even though I love the snuggling in for a few months, I am DONE with the cold weather!! 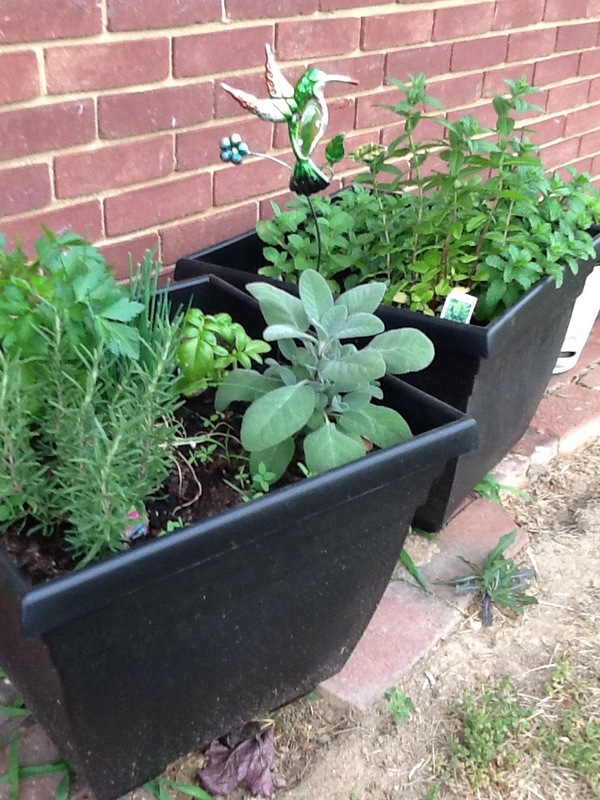 I am longing for warmer temps, sunshine and to be in my yard planting flowers and herbs! We’ve had a few nice days and my windows were open for a little but here in PA we still cannot plant tender flowers. Waiting is so challenging! But I did grab some herbs and pansies at my favorite local garden store!! Since it is still just a little chilly to be planting and playing in the dirt, I have begun my garden plans. I want to fill in the empty area’s in my flower garden beds, I can never ever have too many flowers and plants! But this year I must have raised vegetable gardens! And I am thinking I want to use cedar wood. Decades ago I tried growing vegetables, I had no success whatsoever!! My carrots looked like pencils!! I did manage some pretty awesome tomatoes but that was the only thing I could grow. Frustrating! When I was a stay at home mom and my kids were small, I did a lot of “canning”, so that is another project that I plan to do this year. Hopefully my garden will be plentiful! If not, there are many farmers stands in the vicinity that I can shop for local produce. So, until I can get outside and start playing in the dirt (and find someone to build my raised cedar gardens), I will just continue to snuggle on my sofa and make plans.